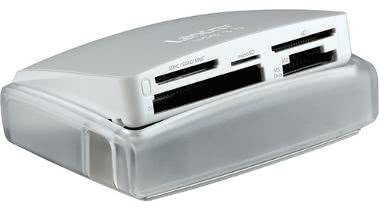 The Lexar Multi Memory Card Reader is a blazing fast card reader for nearly every kind of memory format. You can do file-to-computer transfers as well as card-to-card transfers. When not popped up, the reader protects the card slots to help keep dust out (though it is not weather-sealed). A blue LED tells you when the transfer is complete. You can also run concurrent transfers from different cards from this same reader. Notes: Not for use with CFast cards.